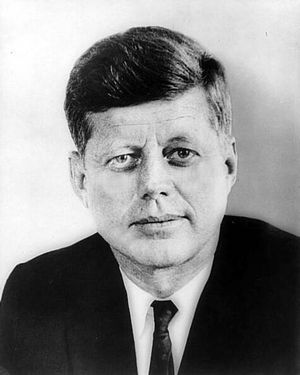 John Fitzgerald Kennedy (1917-1963) was the Thirty-Fifth President of the United States (1961-1963). Kennedy was the youngest ever elected to the presidency and the first of the Roman Catholic faith. Kennedy appointed Luther Terry, M.D. as Surgeon General in 1962. In 1964, Terry issued the first Surgeon General's report definitively linking smoking to disease. The impact of the report was historic. Donald Gibson, Battling Wall Street: The Kennedy Presidency (1994). Donald Gibson, The Kennedy Assassination Cover-up (1999). John F. Kennedy, Internet Public Library. Inaugural Address, January 20, 1961. John F. Kennedy International Airport, New York City. This page was last edited on 21 June 2017, at 20:25.